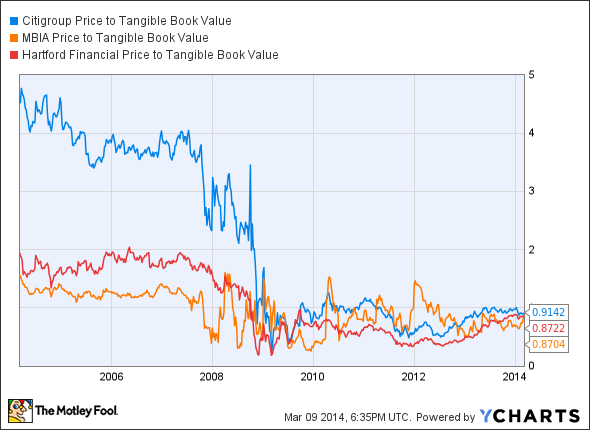 The financial sector is cheap in general, but these three companies are too cheap to pass up. The financial sector is cheap in general right now, and has been for quite some time, but what are the best bargains of the sector? I like stocks that trade for below their tangible book value, because this represents what a company's real assets are worth. If a company is trading for below its TBV and has lots of potential to grow and improve in the future, or has potential to improve the TBV itself, it's pretty hard to go wrong. Citigroup currently trades for just 91% of its tangible book value, which is very rare for one of the "big four" banks, even in the post-crisis economy. Since the recession ended, Citigroup has done a great job of improving its asset quality by winding down its "legacy assets" held in its Citi Holdings division. The company is actively adding healthy loans to its balance sheet, and is consistently reducing its credit-related losses. One major reason that Citigroup is still a bargain is the disappointing earnings release the company put out a few weeks ago. The company is also still seen as a risk, and while the asset quality has gotten better, there is still a significant amount of junk on the balance sheet. Also, with the erratic interest rates of the latter half of 2013, the company's fixed-income trading division didn't do very well. Citigroup has already done an excellent job of growing its tangible book value since the crisis, and it should continue to grow for the foreseeable future, as the company winds down its bad assets and grows its portfolio of good loans. In fact, since 2010, Citigroup has grown its TBV from below $40 to about $54.40 currently, which translates to 8% annualized growth. In other words, even if Citigroup continues to trade at its ridiculously low P/TBV ratio, shareholders are likely to see pretty impressive returns. An 8% annual gain in TBV alone gives us a conservative 2-year price target of roughly $56. MBIA provides guarantee insurance and related services for finance markets. The company has almost $450 billion in insurance in force, including public debt obligations such as municipal bonds and utility bonds, as well as other forms of debt, such as collateralized debt obligations (CDOs) and mortgage-backed securities. Given the nature of MBIA's business, it is no surprised that the company got absolutely crushed by the financial crisis. After the collapse in the mortgage market caused a couple of years of heavy losses, MBIA lost its top-tier financial strength rating, and is currently rated a "C" by S&P. There is still pending litigation, and the possibility that the company will need to raise more capital and dilute current shareholders, but I believe that MBIA is improving and will handsomely reward shareholders who stick with the company. MBIA has historically traded for a pretty low valuation, as you can see on the chart below, as its business has been considered to be pretty risky. Even though I believe that MBIA is worth a lot more than the 88.5% of TBV that it currently trades for, the company's assets have improved (and continue to improve) at a very good rate. Since falling to around $8 per share in early 2010, MBIA's tangible book has more than doubled. The company hasn't gotten much new business, but it has eliminated a lot of its bad business, and will continue to do so. MBIA may be the riskiest company mentioned on here, but the possibility of doubling in value in four years may be worth it! Hartford Financial Services is one of the leading property-casualty insurance companies in the world, with approximately $300 billion in assets. Since performing poorly in the wake of the financial crisis, Hartford has restructured its operations significantly and is now focusing on its property-casualty, group benefits, and mutual fund businesses, and discontinued some risky ones. These moves by the company as well as the improving U.S. economy make Hartford worth much more than the 87.5% of tangible book value it currently trades for. There is some ongoing execution risk here, which could keep the valuation low, but the improving economy means rising insurance premiums in the company's core property-casualty business, which means a higher intrinsic value. Hartford has more than doubled in TBV per share since the financial crisis, and the company will only become more valuable as time goes on due to the renewed focus on the core businesses. I like all three of these companies for different reasons, and this is by no means an exhaustive list of good companies trading for less than tangible book. Even if the sector stays as "cheap" as it is and these three companies' P/TBV ratios stay the same, these companies are becoming more and more valuable as their assets improve, and so will their shares. Any increase in valuation will just be a bonus.